We stock copper alloy C110, which is a general purpose copper designated in ASTM Standard B152. C110 has very high conductivity along with exceptional formability, and is thus ideally suited for electrical and electronic applications. Protocase customers often use copper in custom bus bars (see our Copper Bus Bar page for more information), as well as in other applications. Typically copper bus bars are specified 'unfinished' for electrical conductivity. 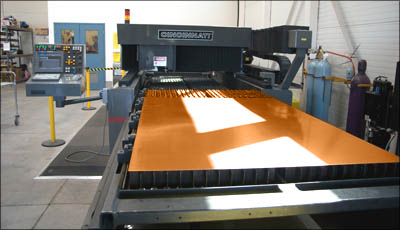 Copper can be powder coated (typically using masking for connection surfaces), for aesthetic reasons or to enhance radiative cooling. We generally recommend stainless steel PEMS for use in copper parts and bus bars. Copper may be tapped, but the user should be cautious when torqueing fasteners due to copper's softness. n/a 0.250" | 6.35 mm ± 0.010"
n/a 0.125" | 3.18 mm ± 0.007"
n/a 0.093" | 2.36 mm ± 0.007"
n/a 0.064" | 1.63 mm ± 0.006"
Note: Copper may be bent to tighter radii, but it may result in a reduction of cross section at the bend which may impact current carrying capacity.